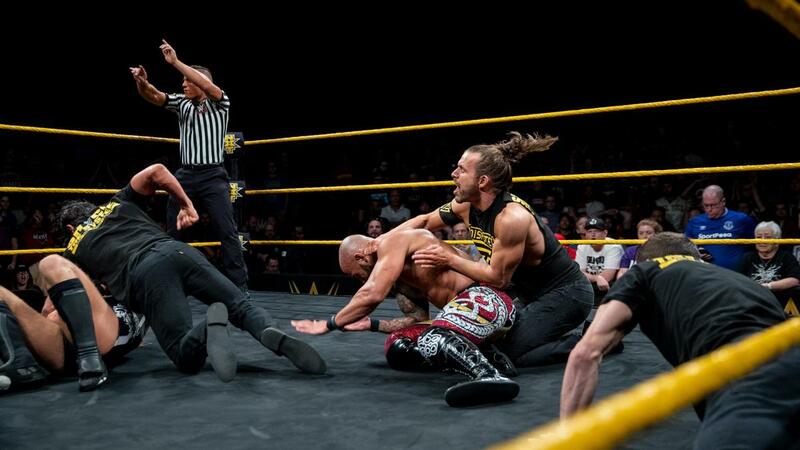 NXT returned to its formula from the 2014-15 days, back when there were only three televised matches per episode, with the last match always being crazy good. I really missed that format, which Lucha Underground continues to go with to this day. It spares us from having too many squash matches or filler matches that make me want to skip ahead to the main event. That said, I'm really thankful they went back to this formula for this episode because I'd been salivating for that Champion vs. Champion matchup, which absolutely delivered. Ricochet and Pete Dunne told a great story, which was paced pretty well, and intensified in the right doses to keep me at the edge of my seat. Granted, I didn't think either of them would become a dual champion by the end of the match. But as they got to the near-falls, I started to ask myself if NXT would actually pull the trigger. I've always enjoyed the way Pete Dunne goes after people's fingers. It's unusual as a tactic, but it actually makes sense since it's pretty hard to ignore the pain coming from the joints in your hand, let alone actually execute moves when your hands are messed up. It was an effective and intelligent way to ground Ricochet, who tried to match Dunne's ground game through the first part of the match. I loved that because it showed Ricochet's versatility and proved that he isn't just a one-trick pony. The key takeaway from the match was that Ricochet and Dunne appear to be evenly matched, to the point that both Superstars seemed flummoxed that the other would keep kicking out. I'd pay to see these two square off in the ring again because I'd have loved to see how they'd shift to fifth gear. I could sense the urgency and desperation towards the end because both guys were taking their opponents' best shots save for, you know, their actual finishers. But alas, those gits from The Undisputed ERA had to come in and ruin a good thing. This was the most likely finish anyway, leading to a no contest, allowing both champions to keep their respective titles. I don't really have a problem with this since I was expecting it. However, I'm intrigued to see where they go from here. Could this possibly set up this year's WarGames match? I'm not sure how it'll shake out since I'm still proactively avoiding spoilers from today's set of tapings. But I wouldn't be shocked if it was The Undisputed ERA vs. British Strong Style vs. War Raiders & Ricochet. You know what, let's lock that down as my prediction heading into TakeOver: WarGames 2. I really enjoyed this main event, which was more than enough to give this week's episode a solid A. Great job, NXT. I'm really not impressed by Aliyah because for one thing, I still have no idea what a "Cat's Meow" is supposed to be. Meanwhile, Lacey Evans is just improving every time we see her in the ring. Loved that finish with the Women's Right coming out of nowhere. Thank you, Dakota Kai and Deonna Purrazzo. Pretty sure that Bianca Belair was shooting the Street Profits' video and playing interviewer. Hey, Montez Ford, I see that Belair jersey you're wearing. Eyyyy. The more I'm seeing out of The Forgotten Sons, the more I'm buying into their gimmick. Jaxson Ryker was really menacing during his match against Humberto Carrillo, especially when he'd shove Carrillo's face and grind it into the mat. Utter disrespect. Knowing Carrillo's pedigree as a luchador, I hope he doesn't remain in the Cezar Bononi/Raul Mendoza role for too long. KEITH LEE VIDEO PACKAGE. Man, this guy is magnetic AF and he wasn't even in the ring at all. The one thing I find weird is how "Bask in my glory" sounds like such an egotistical heel thing to say.